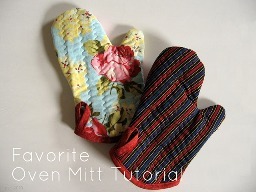 Chris from Pickup Some Creativity shares a tutorial and template for making her Favorite Oven Mitt. Literally. The template is based on an oven mitt that she has used for years and that was showing some heavy wear. She created a pattern to make herself a new one, and shares it so you can make one, too. Get the tutorial and template.